The Guide to Vision – Practical Guide to Discovering Artistic Vision and Creating Personal Style, was created based on my long experience as a photographer, architect, and visual artist, and on studying the best examples of expressing your vision in art and photography. 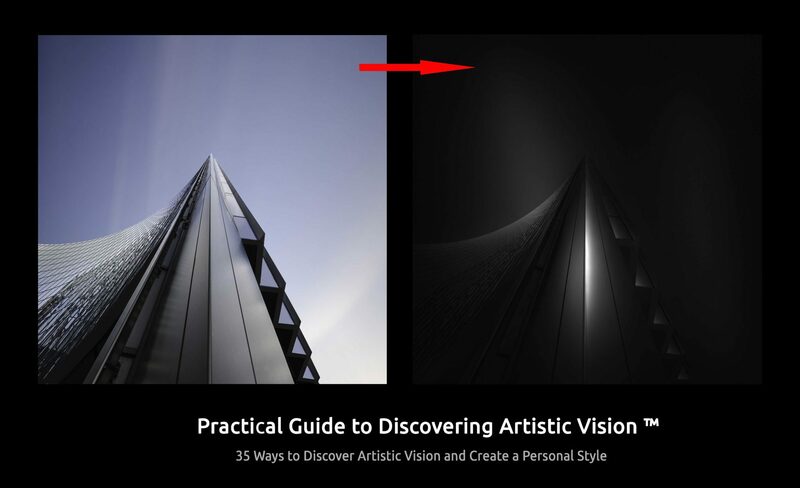 The Guide to Vision – Practical Guide to Discovering Artistic Vision and Creating Personal Style was the first fragment of my book From Basics to Fine Art that I revealed publicly as a sneak peek with highlights of the most important topics treated in the book. I am periodically reviewing this article and adding new ideas, so it would be a good idea for you to bookmark it and come back check it from time to time, or if you subscribe to my website to receive the extensive updates and other black and white photography tutorials and long exposure tutorials I am publishing. Speaking of long exposure, since this is one of the techniques I use extensively in my photography, if you want to learn it you can read my Long Exposure Photography Extensive Tutorial that is a complete guide to this fascinating technique, and you can also purchase my video tutorial I am mentioning below. The book is the product of more than two years of intensive work and also of many years of studying art, architecture and photography. Students from our workshops and mentoring classes have already read the pre-release version of the book and the feedback was more than excellent. The final version is just a couple of months away and will provide you with everything you need to know about B&W Fine Art Photography, architectural photography and not only, artistic vision and personal style, composition and use of visual elements, B&W processing, the business of fine art photography and many more. The world is our vision of the world. The world is a dream, the world is an image. The rules and pieces of advice in The Guide to Vision – Practical Guide to Discovering Artistic Vision and Creating Personal Style are meant to help you get closer to your vision and discover that unique element in your art that can lead you to create a personal style. These rules come from my experience as a photographer, architect and visual artist, from studying the work of other artists and from understanding what helped me (and others) express my own vision in the art I am making. Now, let me present you the 35 rules of The Guide to Vision. Spend time to discover what is your idea about the world around you, about what reality means to you and how you would like to transform it to suit your idea about a perfect world. Use this in your creative process aiming to transform the reality you capture with your camera the same way you would transform it in the real world if you had the power. Use the tools you have to match what you see in the outer world with what you see in your inner world. Study your subject from aesthetical, historical, social and even philosophical point of view so you can be as familiar as you can with it and the context in which it exists. Read books on art (art history, art theory etc. ), photography, aesthetics. Even literature and philosophy can give you part of the aesthetic education you need. Don’t just produce photographs to accumulate images. Find the reason you want to do it by answering to the question: “I need to create this photograph because…”. Fill in the blanks every time you start creating an image and don’t start if you can’t give an answer to why you do it or till you find that answer. The words/ideas you will use to fill in those blanks will contain inside them your vision. Don’t get distracted by the easiness to create in a style that “sells” or by the myth that better gear will make you better art. A better camera for a photographer is like a better paintbrush for a painter, it will only make a difference when you consider the details, it will never replace intention, vision and personal style. You may even want to make a promise to yourself to not upgrade your gear till you find your true vision, this will help you concentrate on the theoretical part of the artistic process and make you reflect more than try out new lenses. Jonathan Swift says somewhere “Vision is the art of seeing what is invisible to others”. You are the only one that sees the world in your own way. Search for that unicity, let it be your guide and express it in your work. Show your true personality in your art and this will become your own style and the best way to express your ideas. Noone can express what you feel better than yourself, you’re the most appropriate person to create your art, use that. You have a unique chance to create a perfect world in your images, your perfect world; to show not what you SEE out there, but what you would WANT to see. There is only one way we can do this and be real enough but also close to what we consider in our mind to be a perfect world: by using our imagination and create an object of art. Art is the only field that is allowed to present a world that doesn’t exist elsewhere than in our mind. This is why we are called artists and not mad people. Even if some see these two terms as equivalents and not only when they joke about it. This is also the reason why it takes an artist’s mind to understand another artist’s mind. This is one of the best ways of expressing yourself through your images. Be unconventional and photograph your subjects like that even if some will not identify with them, because they are not what one would expect from that particular subject. They will give you a frame which has to do with common sense and is the result of the long experience that those who created them (artists and art theoreticians) have in studying art. You can modify this frame in time to suit your own system of values but having this base makes it easier for the mind to concentrate on intention and vision and not have to reinvent a world that has already been invented. No need to know Photoshop by heart, no one does, but you have to be very confident about your processing style and be able to reproduce anything you imagine using your processing skills. Craftsmanship is instrumental in transforming your vision from idea to final image. It is the most important step after having a vision and having captured an image to be the base for your creation. A painter needs to know his colors and brushes, a photographer needs to know his camera and software. These are your tools and there is no excuse for not knowing how to use them well than not being interested enough in communicating your vision. Read materials about new techniques and tools, read/watch tutorials concerning your genre and generally. You don’t need to take anything new for granted, but don’t reject it either without having tried it. You will need to concentrate on the style you choose until you learn everything there is to learn about it, theoretically and practically too. Having ready the visual tools that a genre can offer will remove the stress of finding them and you can be free to concentrate on expressing yourself by using those tools. Then, when you are sure of yourself and have found something unique, you can go on by yourself and even create new ways of thinking, new currents, genres etc. Chances are that you will eventually find a way to express exactly what you feel and think about it if you become familiar enough with it to be able to reach its essence and show its soul in your image. This is usually the easiest way to be original when presenting a subject, because you will develop a tight relationship with it, and thus be able to go beyond its usual representations and find that unique view you are looking for. Do not start shooting right away when you reached your subject. Take your time to first “feel” the place, observe its behavior, learn its angles, understand light and see what it does to the subject at that moment, how it shapes volumes, how it influence colors and textures. Look at the subject with and without the camera. Look through the viewfinder without clicking the shutter, just to discover angles and try out compositions, snap some test shots of the best angles and compositions afterwards, study them to see how they can be improved and when you know exactly what you want, just then take the final photograph that will be much closer to your vision than the one you would have taken without having studied the subject. You can do this either by practicing more than one kinds of art, but mostly in the indirect sense of combining them on a more basic level, in the sense of drawing inspiration from other arts or by combining the principles of different arts to create a new form of expression. One of the best examples of this kind of approach is Photography Drawing, about which I’m taking more in detail in the article at the link above, a method of conceiving and processing your photographs by using a technique that I created and that is based on the principles of classical drawing in black pencil. There is no other way to learn your tools and discover a way of expression than by doing what you do constantly, by practicing till you become one with your art and can easily express yourself using specific tools: images in the case of photography. From experience I can tell you that nothing good comes without a lot of work and on the other side, with a lot of work there will always be something good coming. There is no exception to this rule, believe me. If you dedicate yourself body and soul to what you do and if you do what you love, there is only one way the things can unfold eventually: you WILL get there! This stands in life in general but especially with art. Always have this in mind in times of doubt. You will go through times like this in art, expect them to come, otherwise you are not an artist. This happens because art is so subjective that sometimes you will be the only one believing in what you do and understanding it. Stick to it and you will convince everyone if you try hard enough. Try to make a connection between what you think when you imagine a new photograph, what you do when processing and what you see as a printed result. Always conceive and work on your images having in mind that they will be printed on paper and not seen on a monitor. It gives you a totally different perspective that can determinate the way you will create from then on. This is s very effective way of finding originality, when you try to have a different voice than the ones you hear around you. Even when you do find something in the work of others that you could use in your own, adopt that by adapting it to your style and only if it expresses what you feel and not only because you like it. We may like a different artistic expression but this doesn’t mean it suits our personal style. Nothing new is accepted from the beginning. The aesthetic inertia should never stop you put your ideas into practice. You do not need the approval of anyone else than yourself to create what you need to create, as unconventional as it may be. Do it for you! Do not get discouraged by random criticism and choose very carefully the ones you will accept criticism from, they have to be on the same wavelength and artists that you admire and could consider as mentors. Do not try to please everyone, just try to please yourself and make yourself feel happy with what you do. As they say, you are your worst critic, so if you really please yourself then it means that you achieved your goal. Be honest with yourself and always try to understand after you finished working on an image if you gave to your vision the shape you intended, through the way you captured and processed your photograph. Here be merciless and do not let anything leave your hands to get out into the world unless you are sure that what you are presenting is 100% “you” and your vision. If you see that your message didn’t reach the viewer, go back to the beginning of the process and try to see if maybe you were not clear enough. If you discover that the image is what you intended it to be, then you are right, if you have doubts, go back to the previous point and do not show images that are not 100% you. Some work for years to find what they are looking for in art. There is a common saying that speaks about one needing 10,000 hours of study and practice to get to the level of really mastering his field. While there are ways to speed this process up, this rule is generally true in the case of fine art photography, considering that besides the practical skills one needs to cultivate his eye through study and acquire theoretical knowledge too. It is often the experience, and rather many artistic experiences combined that will get you to the point where you can say you found your vision and this process needs some time to be accomplished. You may have to defend your vision, your methods and approach in front of many naysayers or in front of those who cannot see it and try to replace it with what they understand. Art history is full of examples of artists that were not understood, this is a risk you have to take and many times this is more likely to happen than being understood, especially in the beginning, if you come up with something new. Stand by your vision and you will eventually attain your goal and make yourself understood. To be precise, you never find the absolute truth, you just find versions of it and then you start searching again. This is art, a constant quest. But the manner you will search for this truth and the results of this search will show in your work and will reflect in and be determined by your vision. Deciding to use a certain visual space (architectural or landscape photography, black & white or color, realistic or surrealistic subjects etc) will help you create a visual language you will use in your images and this visual language will slowly become your style, your personal way of communicating, your vision. Follow a subject for a longer time, at least a few months, in which to try to create meaningful relations between the pieces of the puzzle, your photographs. Try to keep the same rules for the whole project: subject matter, frame choice, composition, tonalities, contrasts, titles etc. This framework will give you a safe space where your vision can unfold all its potential. It will be a space where you can be free but not living in anarchy (the rules of the series create enough order for you to feel safe and free to search for and express your vision). More, bigger, newer, fancier cameras and lenses, smarter software will not bring more imagination or emotion in your work. Learn your gear very well so you know what you require from it to create the kind of art that you imagine, but try to rather limit it in order to rely more on yourself and less on your gear to create. This way you will focus more on being creative than on counting pixels and comparing lens distortions. The same approach applies to software, learn it very well but do not expect it to create in your place. But do try different techniques to discover which one suits your artistic goals better, finding the right tool that you can handle with ease will allow you to concentrate on expressing your vision and style and not on searching for a way to express it. Do not wait to become proficient in Photoshop either, both discovering a vision and a personal style as well as becoming better in processing have to be pursued in parallel. Why? Because this is how you will learn the skills faster. If you need them to express yourself and to create what you have in mind, you will work harder to acquire processing skills than if your only goal was to learn a new technique. It is more likely that you will find your vision if you spend more time searching for it than if you rush to finish your work before it becomes perfect. You are creating art, art needs time to be created. How long do you think a painter spends on a single painting? Could be months. Aim to spend just as much as you need and you will give yourself time to discover your vision and express it. Imagine that you are creating your Mona Lisa every time you work on an image. It is that important! Try to first please yourself with your art and do not bother about what others will believe. As long as you are not working on paid assignments, you have total freedom of expression, from choosing the subject until the manner you will present it. Use this to your advantage and leave yourself free to express your inner world. As a consequence, you will start being in love with your own work and find inspiration in it. Your vision might be a product of your mind and imagination, but everything starts in your heart. We need our mind to process and interpret emotion so we are able to communicate it, but this emotion is triggered by what is happening in our heart and it aims to be understood by another heart not necessarily by another mind. So it is very important to understand what is happening at the base when the emotion is being born and to allow for the process of creation to start from our heart. DO NOT FORGET to have fun while creating. Feeling good about what you do and the results of your work will make you unleash your creativity much easier and in a much more powerful way. I hope you enjoyed this Guide to Vision, this practical guide to discovering artistic vision and creating personal style and that it will help you get closer to your artistic vision and to creating the photography that makes you happy. As mentioned previously, the complete extended version of this guide can be read in my book From Basics to Fine Art – Black and White Photography. Posted in Inspiration Creativity, Most Popular, Tutorials Fine Art Black and White Photography. RSS 2.0 feed. Very glad you found it helpful, Andreas. This will be more or less the style of the book, information and advice in a concentrated form, covering everything that could help you get better in fine art photography and express your true vision and style. Thank you for sharing Julia. My website needs a complete makeover, that’s next. Thanks very much, Rich! Looking forward to your new site. Good luck with it!